This week's Bake Of The Week is Honey Blueberry Whole Wheat Muffins. I'm trying to eat healthily nowadays. And cakes and muffins and stuff like that are actually quite unhealthy. With all the fats and sugar and empty calories, they are erm...very unhealthy. So this recipe calls for whole wheat flour to add more fibre into my diet and also uses only 2 tbsp of canola oil to reduce the fats. Also, I use blueberries which is one of the 'super food'. The Produce Bible tell us that blueberries contain "cholesterol lowering compounds, antioxidants, Vitamin C, potassium, folate, and dietary fiber. It is even thought that their consumption can have anti-aging effects." I've made a few changes to the recipe. I don't have unsulphured molasses so I used honey. I don't have wheat bran so I changed it to whole wheat flour. I also brushed the top of the baked muffins with some honey, giving it a honey blueberry flavour. 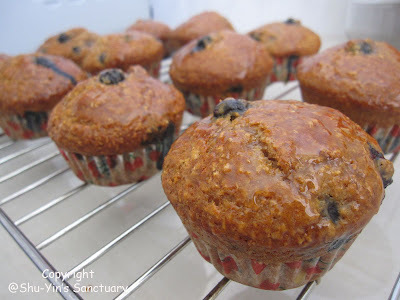 Blueberry Bran Muffins: Preheat oven to 375 degrees F (190 degrees C) and place rack in the center of the oven. Line a 12 cup muffin pan with paper liners or else spray with a nonstick vegetable spray. In a large bowl, stir together the flours, wheat bran, sugar, baking powder, baking soda, salt, and ground cinnamon. In another bowl whisk together the lightly beaten egg white, molasses, vanilla extract, oil, and buttermilk. Add the wet ingredients to the dry ingredients, and stir just until moistened. Gently stir in the berries, making sure not to crush them. Makes about 12 - 14 standard-sized muffins. im using the cheap portable oven. not the canggih built-in wan.